Does anyone have info when the book will be completed? His website has he is completing it. It will be a must read for me when it comes out! David, you might find this link useful. With the resurgance of Bing's overall popularity (CD's, DVD's, websites, etc.) I think this long-awaited book will be a big seller. After all, this is the period of his life which will bring the most interest in what really occured. Some of it won't be pretty, but it's time to get the real, honest story of WW II Bing at the absolute pinnacle of his success and his personal ups and downs afterwards. Coming from Gary, we know it will be tastefully and respectfully presented. From what I've read, it doesn't look like I'll be picking up my copy of Vol. 2 from the Leeds meeting later this year, but - having said that - I hope that Gary's 91-year-old mother won't have too long a wait before she settles down in her armchair to read it..! Eagerly awaited - and I'm getting older too! Yes, the article which Malcolm flagged is revealing and, I suppose, not surprising. I've read Gary Giddins' Bing biography several times and I daresay I'll read it again before volume 2 is published; I can't wait for that. I gave a spare copy to our local library. I wonder who often it's been borrowed. I must ask the librarian. The following appeared on Gary’s website on February1. 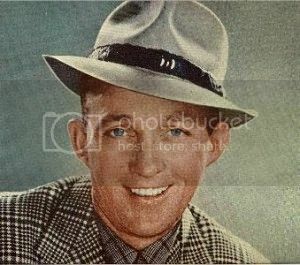 Work is steadily progressing on Volume 2 of the Bing Crosby biography. One friend I’ve spoken to has read new chapters – she says “If the rest of Volume Two is as good as this, the fans, who’ve been breathless with anticipation, are sure to be in for a feast!” Stay tuned for news when we’re allowed to share more! He is WAY WAY overdue on this project. I thought it was all done and he was awaiting publisher's release date. How disappointing to hear this. I agree that it is disappointing that the second volume has been delayed for as long as it has, but I for one am just grateful that the project is still on the blocks. Hopefully I'll be able to pick up my copy at the Leeds meeting later this year after all! It may be out before Leeds and you have finished reading it. Now, that would be good. Any updates on volume 2? I am starting to believe it will never come out. Haven't heard anything at all I'm afraid. Hope it is out soon, as the first volume is excellent. Mind you, we shouldn't be too concerned. Volume one of a new biography of The Beatles has just come out; there will be three volumes in total, and the final one won't be complete until 2028! John, I'm a big Ringo fan. I read he has a special book coming out. Did you read anything about it? Sorry, I haven't heard anything, but he said last year that he would never write an autobiography. John, I think it is going to be a photo book. The book was expensive and I believe it is soldout. They were signed by Ringo and came with drumsticks. discussion is going on about Volume 2, and why it has not yet been released. forward as an electronic version (E-Book) only . JoeM, I have heard that too - sad to say. With the sales of books plummeting, I am afraid that vol. 2 will never see the light of day. I'm not trying to be a pessimist - but a realist. I also heard a rumor that Sepia is not issuing anymore Bing related CDs either. Don't know what's happening about Gary's book but the trouble with the delay (if that's what it is) is that it may prevent other writers tackling Bing's life. Re Sepia, there are no pending Bing issues at the moment but if we come up with something that they like, I am sure they would issue it. Last time, I spoke to the proprietor the "Bing in the Hall" CD wasn't selling very well. Haven't heard how the AFRS CD went yet. This is sort of off topic, but you know what a wonderful issue would be for Sepia? I wish they would be able to continue the excellent Going Hollywood CD series that Jasmine did awhile ago. There are some great movie soundtracks that I wish were released. Sad to say, but I think the re-emergence of Bing in the 21st century has peaked and (barring any miraculous burst of nostalgia becoming trendy) he will slip away from most people's memories except for the Christmas holidays each year. Next year expect a huge media push to celebrate the Sinatra Centennial and that will certainly keep Bing in the background. UNLESS this book gets published and it gets really, really good PR. David, funny you should mention the Going Hollywood series. Geoff Milne (who produced it) has enough material for vol. 5 and he has it in mind to prepare it if he can find a record company that's interested.